Editor’s Note: Due to high calls, the Lion’s Club of Indiana has contacted the people who originally booked the event and told them that they do not want their business. We were told on the phone by the Lion’s Club that they do not agree with the views of these groups and are opposed to them. They also stated that the fascists told the Lion’s Club on the phone that they had already found another venue and that the event was still happening. So stay vigilant, but as for now, it appears that the Lion’s Club event has been shut down. The Traditionalist Workers Party, which recently made headlines for joining with other neo-Nazis in the failed rally in Sacramento as well as promising to promote Donald Trump from left-wing detractors, is one of the co-sponsors of an Indiana event promising to bring in “Patriots and Constitutional Nationalists.” The event is billed as hosted by The Sons and Daughters of Liberty Radio, a racist mouthpiece for the Midwest militia movement. The Indiana chapters of the Soldiers of Odin, a racialist vigilante group formed to attack Muslim refugees, will also join as organizers of the project. The III%s and the Indiana chapter of American Patriots United, as well as unnamed “local car, motorcycle, and truck clubs” have also added their name to the event. This is a surprisingly large event for groups such as these, and an open statement from the regional militia movement that they are closely allied with groups that are open about anti-Semitism, Holocaust Denial, and racial nationalism. Heimbach, the founder and leader of theTraditionalist Workers Party, states publicly that he believes there are racial differences in intelligence, that Jews are running a global conspiracy to destroy the “West,” believes that queer people should be executed, and that the Third Reich should have won World War II. For groups like the Patriots that attempt to venerate veterans, this seems like a reasonably broad oversight. According to their public posts, the key organizer of the event is Brien James, who is also the person behind American Vikings Clothing. The website for American Vikings explains that the clothes were originally made for the “MMA and ATV crowd,” yet then falls into bizarre tribalist nonsense about the Havamal, which is a collection of quotes supposedly from first millennium pre-Christian Vikings. While the book is often used in pagan circles, the openly Nazi “Wotanist” branches have specifically appropriated it, mainly because it is easily quotable and focuses on warrior lines that sound intimidating. The website has a section labeled “Havamalism,” which he explains is a focus on the “masculinity” seen in Norse paganism. The most basic description for Havamalism would be that it is the use of the writings known as the Havamal, as a basis for guiding ones self through life. It is also much more than that, given that I have specifically created the term to stand in both support of, and in contrast to, some widely held beliefs and modern ideas within the Nordic Heathen community. Havamalism places less emphasis on the scholastic and ritualistic applications of Nordic Heathenry and a stronger emphasis on physicality, masculinity, and general spirituality. We believe in the idea of Valhalla. Literally. We would rather strive to go there than die the straw death. We believe in honor, combat, and righteous violence. A portion of the Heathen community has been infiltrated by weak universalist progressives who can name you every God and Goddess, and dress up and do an excellent blot, but when they insult another man and he challenges them… they are lost and afraid. Always left making excuses about what “battle” and Valhalla do and do not mean in the modern age. We stand in stark contrast to these people and ideas. Battle means what it has always meant. Strength and honor mean what they have always meant. In another section labeled “Be a Man,” he has some illiterate rants with coded racial language, all of which is meant to goat readers into acting like “a warrior” while attempting to sound like a working-class philosopher. The best way to keep the chimps and hyenas at bay is to mold yourself into a lion or gorilla. Humans are animals too. Be a ferocious one. Be the hero of your own life story. An able protector. A warrior. Instead of watching formidable men play sports and obsessing over it, go to the gym. Skip the bar Friday night and buy some boxing gloves with your buddies. Get punched in the face. Realize that you aren’t fragile. Carrying a warm mildly sore black eye around feels good. Feels alive. May just be the first time you ever really felt like a man in your life. Try it. Learn the difference between pain and injury. Realize that they both heal quicker than fear or shame. Make yourself formidable. Stand up to anyone and everything that you think is wrong. You might get hurt. You might get arrested. Sure. You might even die in the process. The actual clothing us even more blatant than the rest of the website’s attempts at primitive pseudo-philosophy, where he sells “White Pride” shirts and clever lines like “This Cracker Won’t Crumble.” Along with various Nordic pagan themes he has ones that just say Irish in the center, which seems a bit ironic given the fact that the Vikings took the Irish as slaves and sacked their homelands repeatedly. A false history has been constructed in the minds of many white nationalists who literally see Irish and Scandinavian history as the same, erasing the historical ethnic conflicts and subsuming them into a constructed whiteness. Brien is also the founder of the Sons and Daughters of Liberty Radio, as well as a current “Councilman” for their board. Brien’s own friends list shows how deep many of these connections run, between the patriots, the Alt Right, the Men’s Rights movement, and neo-Nazis. 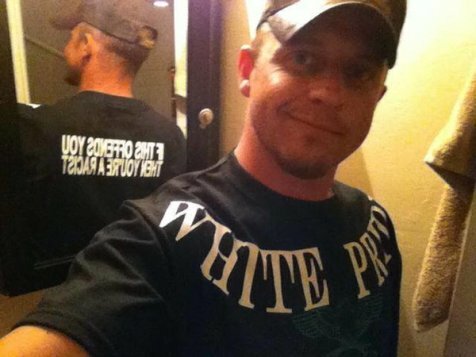 His own connections include Justin Garcia, the host of the male tribalist Pressure Project podcast who often hosts Alt Right favorites like Jack Donovan,Richard Spencer, and Jared Taylor. The Traditionalist Workers Party’s Matthew Heimbach is among them, as well as fascist politician Augustus Invictus, Trad Worker co-founder Matt Parrott, and Indiana KKK organizer Thomas Buhls. The rest are filled with skinheads from the reformed American Front and other organizations, and it is mainly a mess of Trump posters, neo-pagan insignia, and patriot militia banners. The Traditionalist Workers Party is always apt to network at events like these, especially since patriot groups are slightly less reviled than they are. Young members of TWP/TYN like Charles Brown are going to be in attendance. Matthew Heimbach is set to give a rousing speech at the event, which shows that they have to be clearly aware of who he is and what his message is about. The music will be provided by pseudo-Nazi Paddy Tarleton, who got booted from playing in folk music bands in the Northeast after his association with the White Student Union, the Traditionalist Youth Network, and other racist organizations. His songs often include snide references to Jews and people of color, and he openly advocates for creating a white Ethnostate, forcefully deporting non-whites, and attacking Jews. Tarleton recently made a fool of himself after he was tricked by Antifa organizers to reveal inside information about the Trad Worker /Golden State Skinhead event in Sacramento, as well as revealing that the organization did not have unity about that event. Keystone Skinheads, a notoriously violent neo-Nazi skinhead street gang, have openly been invited, and will be trying to mobilize membership to go to the event. Note: This event at the Lion’s Club has been shut down, but according to LC officials, they Neo-Nazis have already moved the venue. Just a few days ago, we ran a story about the Traditionalist Workers Party linking up with Patriot and skinhead groups to hold a community event in Charlottesville, Indiana. The event was booked to be held at the city’s Lion’s Club lodge, which looked to be an inside/outside event for the facility. Several Lion’s Club members voiced their outrage about the event, and anti-racists and anti-fascists in the Indiana area, and from around the country, went to work to counter the scheduled event and contact the Lion’s Club International. The Lion’s Club acted quickly after being notified, putting out a public statement noting that they did not know the nature of the event and that they were canceling it. The event which you referenced, was not a Lions Event. The Charlottesville Lions Club was given misinformation regarding the event, when someone asked to rent their building. Once we were all made aware, Charlottesville Lions realized they did not have a contract for this event, and actually the building was double booked. It is my understanding that the venue has been changed. Lions Clubs do not condone these types of meetings. They are in direct violation of our Code of Ethics. The local chapter of the Lion’s Club also put out a statement saying that they were not involved with the event. This is a positive move for a community organization like the Lion’s Club, which took a strong anti-racist stand much more quickly than many community organizations do. Brien James, the organizer of the event, had to issue a public statement to supporters that they event has lost its venue and is being changed to a private one. This information is no longer public, and you have to message James specifically to get the information. This will all but cancel the event as communication will be difficult and the location will likely end up being difficult to distribute widely. Since it is likely a private residence, there is a smaller likelihood that large numbers will even want to attend. James found our original article and foolishly commented on it, attempting to distort allegations of the event’s racialist nature. Come on out if you want. We have nothing to hide. The event is open to the public. There will be people of all races and faiths attending. The 3%ers, SDL, and SOO are all multi-ethnic groups. One of the bike clubs invited is a black bike club. If you are genuinely curious as to what is going on you are welcome to send a representative. If you are just hell bent on looking for trouble you can find that too. As we reported in the original article, James’ racist organizing and views are well known, as are the organizations involved in the event. No matter what type of posturing he attempts here, anti-fascists are aware of his true intentions. The canceling of this event is from the direct work of anti-fascists who reached out quickly and organized both an on-the-ground response and those who called in to pressure the Lion’s Club. This is a great show of unity as Alt Right groups reach out to Patriot militias and traditional Nazi organizations, all emboldened by the Donald Trump campaign. The Trump train is going to be coming to the Pacific Northwest as a sort of end of the GOP hate-bus. Donald Trump is now battling for the 1,237-delegate number so that he can win the Republican Presidential nomination without contest, something that Ted Cruz and John Kasich came together to try and stop. Even though Cruz and Kasich have officially dropped out of the race, there could still be a certain amount of fear hanging over the Trump campaign about what is going to happen in Cleveland if they do not skate in above the cap. This means more stops than normal, even though it is clear that, by standard delegate counting, no Republican politician could possibly beat him at this point. Even companies like Microsoft how now dumped their support of the RNC so as not to be associated with Trump, showing that even the GOP is being dismantled by a fascist coup on their already existing right-wing ideology. Besides normal stops in places like Seattle, Trump is planning on coming to Vancouver on May 7th. This stop puts him in earshot of Portland, as Vancouver is one of its suburbs, just across the Columbia River. Though people thought he would make regular Oregon stops since Trump campaign offices opened up in both Eugene and Tigard, Oregon, given that this appearance is just ten days away from the Oregon primary, this may be the only stop in the Portland metro area. He then announced that he will be coming to both Eugene and Medford on quick stops the day before, Friday, May 6th. Oregon and Washington left and radical organizations have come together in a united front to confront this event, hoping to replicate the opposition that shut down the Chicago event or blockaded roads in the Southwest. A rally has been planned by a coalition of groups including a range from OneAmerica Votes, UFCW and SEIU locals, Bernie coalition supporters, and a range of groups that are taking a radical contingent, including Hella 503, the Portland Solidarity Network, and the Black Rose Anarchist Federation. This effort has only been bolstered by recent confrontations with the Portland State Students for Trump, who brought in militia supporters from the conspiracy-depot Infowars to bait, harass, and intimidate counter-protesters from the Portland State University Student Union. Their founder, Vladimir Kolychef, is an open nationalist who is regularly posting “race realist” content on his Facebook, sharing quotes from National Alliance leader William Pierce, and using in-jokes from white nationalist websites like the Right Stuff and the Daily Shoah. The Trump campaign has continued to network them besides this information being known, and Vlad continues to publicly state that people have color have a lower IQ than whites and that he prefers a state close to that of Pinochet’s Chile. It is unsure whether or not their will be open fascist or racialist participants, but the American Front does have a foundation in Vancouver, Washington. The militia movement seems like it will be the largest racist contingent, coming after the Malheur standoff and the recent call from Infowars to stand with Trump supporters against leftist protesters. The rally is planned outside the venue on Saturday, May 7th, where speakers will be highlighting Latino voices that are being targeted by the Trump campaign and its racist supporters. Organizers and anti-fascists are calling for all those that oppose Trump’s fascist program to come out and confront him and his supporters directly, and show that they are not welcome in this area of the country, period. Come to the event and join the anti-fascist and anti-capitalist contingent, which shows that we support the broad anti-Trump coalition and that we make up a more militant base that will do what it takes to shut down Donald Trump! Right now the exact time and location is not available, and will likely not be released until the day before. We will share that information right as soon as it is available, and update this article. Below is the Facebook event for the counter-action organized by the coalition, and before that is a Google form that one of their organizations is using to get phone numbers to send last minute text announcements to.